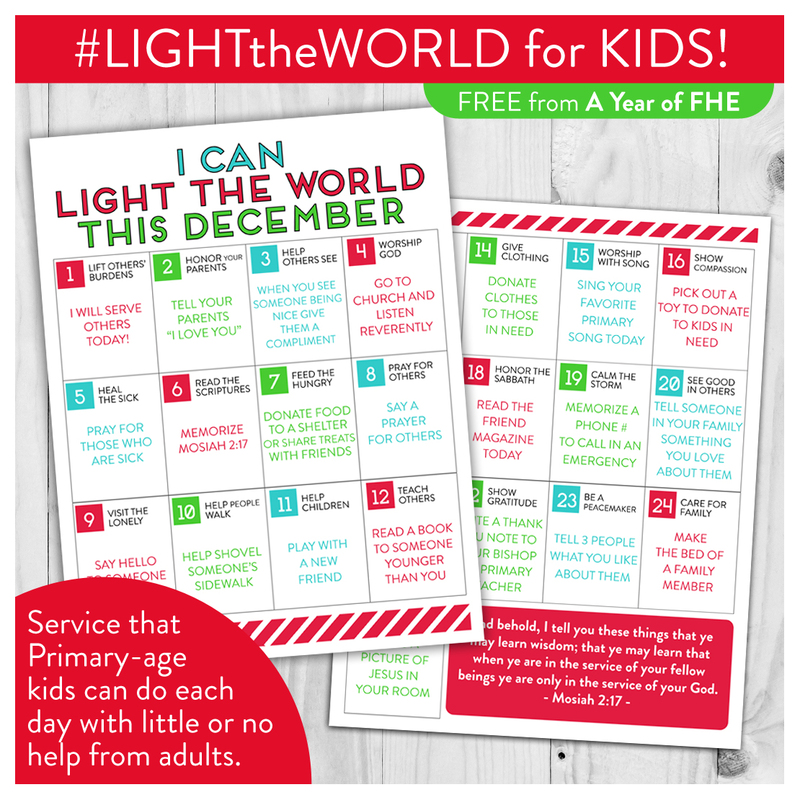 A Year of FHE: FREE DOWNLOAD // LDS LIGHT the WORLD Service Calendar for Kids! FREE DOWNLOAD // LDS LIGHT the WORLD Service Calendar for Kids! A great Facebook follower left a comment this past week about wanting a Service Calendar from the LIGHT THE WORLD campaign made just for Primary-age kids. What a fantastic idea! I went through the theme for each day from the provided Advent Calendar from Mormon.org and made a corresponding calendar for kids! Each day has a very simple task that can be done with little or no help from adults. What a great way to get small kids involved in ways that they can accomplish themselves!! Thanks for the great idea, Millie! love this and love YOU! Thanks! So lovely! Thank you so much! Thank you! What a great thing to share. I'm excited to start my family on this service month. I was getting ready to do a similar thing to hand out to the Primary kids tomorrow, but you just saved me a TON of time! Thank you so much for sharing your talents and blessing others lives. Thank you! Perfect for the Primary this week!! Thank you for sharing your talents with us! I love how simple but wonderful this is. It's the perfect way to light the world with my 4 kids. Thanks so much for sharing your talents by making this awesome Calendar. I shared it in RS today as part of my lesson and they all loved it. This is awesome! I'm totally doing this with my kids! Thank you! This is PERFECT - I am going to LOVE using this with my activity day girls this week! THANK YOU SO MUCH! Still dealing with lack of energy from caring for my disabled daughter and grief from her passing. I have 2 energetic boys that I want to teach the true meaning of Christmas and blessings of service. Thanks for helping make it so easy. Thanks for sharing! Love this! Would also love for you to re-do the one for grown-ups. I'm putting the kid chart up on my wall, and want to put the grown up calendar up for my bigger kids- but it's not as pretty! Thank you! This will be perfect for my littles! Thanks so much for doing this! We were just looking at the challenge for FHE tonight and this is perfect to help keep us on track with a visual. Love it! Thank you! This is JUST what I was looking for! A more simple way for my younger kids to participate in this service opportunity! Thank you again! I so love this. Its simple enough to implement with the crazy month of December but still very meaningful! Thank you! Thank you so much! Is there anyway I can get an editable version of this? There are just a few things our family wants to do different. thanks! We were planning to print the calendar the church posted and give one to each member of the primary. So this is PERFECT!!! Thank you thank you!! This is great, my kids are going to love this!! Thanks! Thank you so much! We gave one of these to each of our Activity Days Girls and I am hanging one up for myself! I love this so much!! Thank you!! I can't get anything but two blank pages when I click download. Help!!!! I can't get anything to come up when I click download. LOVE this!!!! I wish there was a less-LDSy version (Bible scriptures instead of BOM, church instead of primary, church leader instead of Bishop, etc) because I would LOVE to share this with my mother's group which meets at another church. I want to share the power of this, but not be too LDS preachy ;) If you have that version (or can make it) PLEASE let me know!!!!!!! I am unable to download this to my box as well. Could I get a copy of it emailed to me too? stephknudsen@gmail.com Thanks! I was really struggling with doing the standard one from mormon.org with little children. This should help! Hoping You Do this Again this year!! Looking forward to this year's version as well! Any chance you'll do this again for 2017 to match up with the new "Light the World" themes for each day? This was really a game changer for so many Primary kids last year because they could do it independently. Amazing impact, I'm so hoping to see another one! REALLY needing ideas. Any Ideas on how I could use this calendar for Sunday's Sharing Time?? Emilie! Seriously this is amazing! I'm pinning and printing to share with my primary kids and my own kids. Thanks so much! I absolutely love these ideas and lay out. I was going to print this off for our primary children and I can't seem to download it. I would LOVE to be sent the file. Thank you! Do you have the Daily posters that you made last year? Would love to have those as well. Can't thank you enough for all these great programs. LOVE it!! Thank you so mucj for sharing!